Swimming pools often deal with algae. Algae spores constantly enter the pool via wind, rain, debris, or even contaminated swimsuits or equipment. 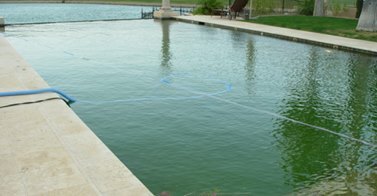 “Green Pool” or the growth and spread of algae happens when the algae bloom from imbalanced pH in the pool water, is exposed to nitrates and/or carbon dioxide, strong sunshine causing warm to hot temperatures, and combined with lack of proper circulation, filtration and sanitation of the pool water. If you combine pool issues, and conditions and an algae bloom can occur seemingly overnight.Algae are a living aquatic creature that multiplies rapidly on warm, sunny days. Containing chlorophyll, algae utilize photosynthesis to grow. That is, they take in carbon dioxide and expend oxygen as a byproduct. Algae itself is not harmful, but algae may harbor pathogens like e-coli bacteria. When these conditions are not treated it can decrease the effectiveness o filters and increase the demand for chlorine, consuming chorine that should be working on other contaminants in the water. If you experience an algae boom, or you cannot see the bottom surface of the pool, it may be necessary to do an “Acid Wash” or “Chlorine Bath” to return the pool to perfect balance and clearity.